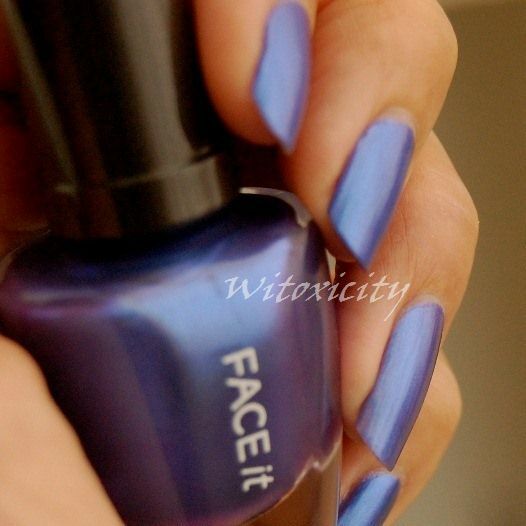 Here's another polish from the South Korean brand, TheFaceShop. As you may know, many Asian brands like to name their polishes with an abbreviation of the colour followed by a series of numbers. BL602, a blue, fits right in. I received this a while back from the lovely Dina who, unfortunately, is taking a break from blogging. The long and the short of it is that it didn't start out as a swap, but it ended up being one. If you're reading this, Dina, thank you again! 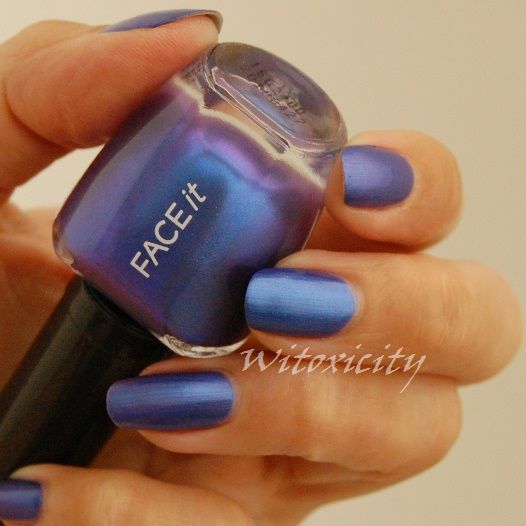 I don't know from which collection this polish is because the BL602 currently shown on TheFaceShop website is a baby blue. Describing this BL602 as just a metallic cobalt blue does it absolutely no justice. It's much more than that, really. You might have noticed it already. BL602 is a cobalt blue that glows purple. It is a duochrome but the purple is very subtle on the nails. You see it and yet you don't see it. The purple is more obvious if you looked at the bottle. The formula during application was fine (three coats here) but I had a lot of trouble with bubbling as it dried. I had to re-do a few nails because they had far too many bubbles. I thought I had waited long enough for each layer to dry (about 15 minutes) but apparently, that was not enough. Application of thinner layers and waiting 30 minutes between coats did help matters but I still noticed a random bubble here and there. And no, I didn't shake the bottle. Notice the bubbles on the middle finger (below). Nevertheless, I think it's a gorgeous polish. In a holistic sense, it's a cobalt blue with purple aura. 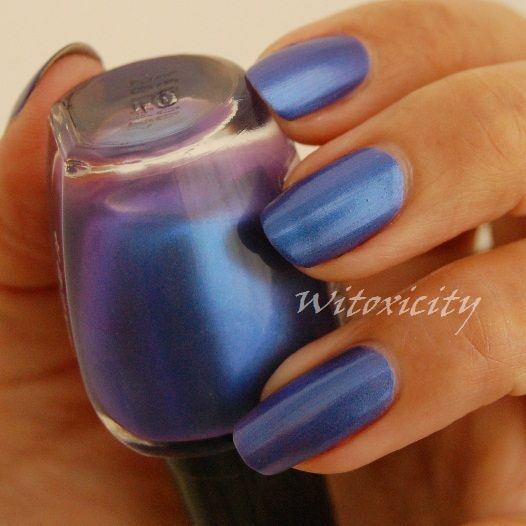 I am a big fan of cobalt blue,so this polish looks awesome. The purple aura looks gorgeous. What a pretty color and finish. :) Sorry to hear about Dina--maybe she'll come back soon? Ooh! 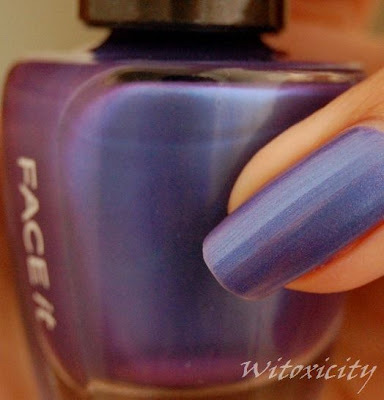 This reminds me of that Essence Blue ray polish from the holographics collection :o! But this one is, I dunno, softer in terms of colour? I like how the duochrome effect with this one is so subtle :). 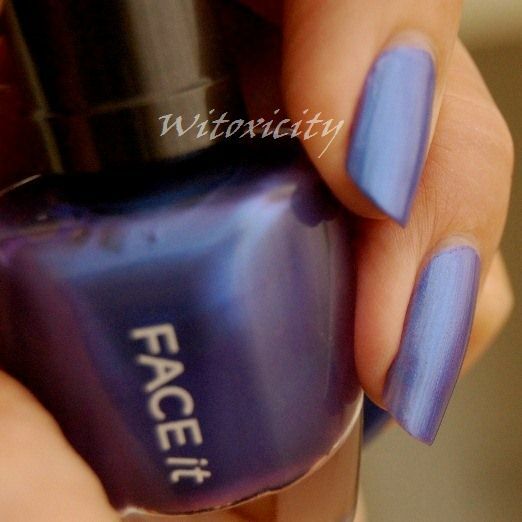 I love your photo on Witoxichic, the blue nailpolish really stands out (like 3D). Your bracelet is amazingly COOL! Hehe, we should dub it 'The Soft Blues' or something :p. It deserves an actual name as it's so pretty :D! If you like that blue you should try GOSH Metallic Blue, it's a bit lighter but a truly magnificent colour. It's probably a bit more accessible as well, sold in Superdrug in UK. Only trouble I found was because of the high metal content it chips a bit too easily on your finger nails but a couple of top coats would overcome that, it's also the fastest drying polish I've ever seen. Lasts ages on toe nails... (I've got nothing to do with Gosh either).